← How to register your Advanced PDF Tools Command Line? There are only three steps in the conversion of doc to dib or docx to dib with the help of docPrint. You will master the conversion way in no more than two minutes because the whole conversion process of doc to dib will not surpass two minutes. docPrint is also an application of docPrint Document Converter Professional which is an expert in document conversion. So if you want to use docPrint, you should download docPrint Document Converter Professional first at http://www.verypdf.com/artprint/docprint_pro_setup.exe. Then install it on your computer according to the installation wizard step by step. You can set docPrint as the default printer in the end of the installation, which will give you convenience in the conversion of doc to dib. Now you can convert doc to dib with docPrint. Please open a word document and click “File”—“Print” to open “Print” dialog box. 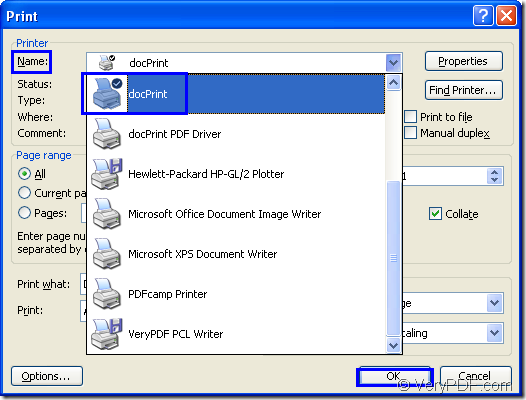 Then choose current printer as “docPrint” in “Name” combo box and click “OK” button. Please see Figure1. To open this dialog box, you can also use the hot key “Ctrl”+ “P”. 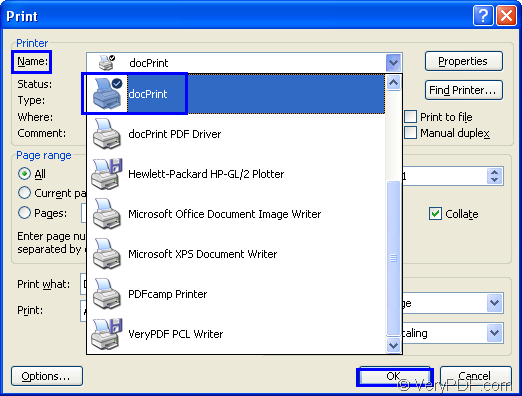 If docPrint is the default printer, please right click the word document and click “Print” option to run docPrint directly. In “docPrint” dialog box showed in Figure2, you should take some methods to open “Save As” dialog box in which you can make settings to the output file. 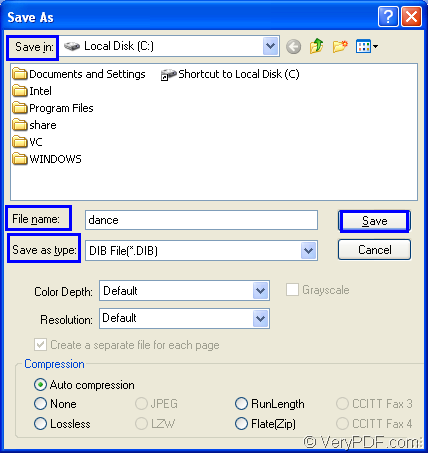 You can click “File”—“Save as” to open the dialog box. You can also click the icon in the toolbar. The hot key “Ctrl”+ “S” is always a good way to resolve problem in a quick way. Please see Figure3 in which you can see a dialog box named “Save As” which can leads to finish the whole conversion of doc to dib. 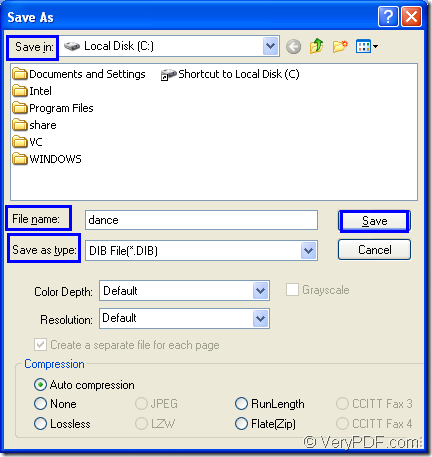 Please get the output file saved in a suitable directory in “Save in” combo box. Then you should edit the name for the target file in “File name” edit box. You can choose the file format for the output file in “Save as type” combo box. Then click “Save” button to save all the changes. The conversion of doc to dib will run itself then. You can browse the target file in specified location on your computer by some kind of image designers. Welcome to leave messages if you have any questions. If you want to learn more information about docPrint, please click the website:http://www.verypdf.com/artprint/index.html. How to convert files of AutoCAD to avs? Does anyone know how to create JPG from Word documents? This entry was posted in docPrint Pro and tagged doc to dib, docx to dib. Bookmark the permalink.